Just over a year ago I compiled a set of numerous images from the Trombone History Timeline of angels playing trombones atop organ pipes. You can see that post here. One of the common factors of those depictions is that they are all from Germany. I have just added another trombone and organ picture, but this one is from Prague, Czech Republic. The caption and photograph are below. You can see it in the broader context of trombone history in the 18th century timeline. 1746—Prague, Czech Republic: An organ by Tomas Schwarz is completed and installed in St. Nicholas Cathedral. 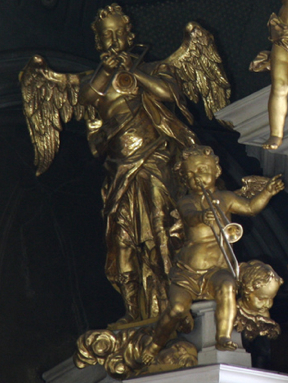 Atop the pipes of the organ are numerous angels playing musical instruments, including trombones (see below image).